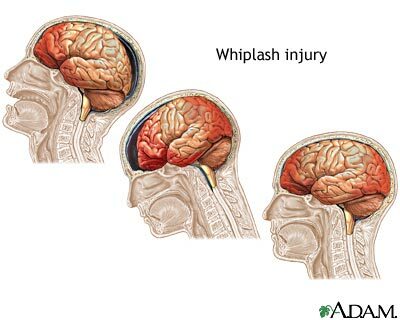 Head injury can occur when the head and neck is thrown violently such as in an accident. This type of head injury can also cause injury to the brain by causing it to rebound in the skull. As a result the brain may bleed, swell, and dangerously increase in pressure. Updated by: Amit M. Shelat, DO, FACP, attending neurologist and Assistant Professor of Clinical Neurology, SUNY Stony Brook, School of Medicine. Review provided by VeriMed Healthcare Network. Also reviewed by David Zieve, MD, MHA, Isla Ogilvie, PhD, and the A.D.A.M. Editorial team.